A newly published white paper by Marketech reveals what 3,341 trade show attendees, in interviews held at 30 events, said caused them to visit trade show exhibits. 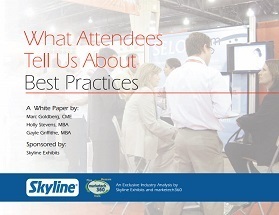 Skyline has sponsored this new research report and made it available free to exhibitors, who can get a copy by requesting it here. Product: The number one reason given to enter a trade show booth was to obtain product information (32%). Add product demo (11%) and you get to 43% of booth visitors interested in product. So being ready to help attendees to learn about your products is paramount. Promotion: There are several reasons for visiting a booth that can be grouped under promotion: Giveaway (17%), in booth activity (11%), refreshments / hospitality (8%), ad / promotion (5%), and invitation (1%). Those add up to 42% of respondents. So consider this – does your promotion budget equal 42% of your trade show budget? Probably less – so promotions are worth the investment. People: Attendees said they visited booths because of the greeter (13%), product demo (that a person usually does!) (11%), and to see a rep (10%), which adds up to 34% of interested attendees. Thus, the people that you choose to staff your booth truly matter. Other findings from the study. Sponsorships and ads do increase brand awareness among trade show attendees, but do little to increase booth visitation. If the goal is to get leads, then sponsorship appears to be the wrong promotional tool. Giveaways and greeters are effective investments for driving booth traffic. Trade show booths are the intersection of people, product and promotion, and all are essential in attracting attendees. When asked who started the interaction between them and the booth staffer, attendees said that 89% of the engagements were started by the rep. So without booth staffers that engage visitors, exhibitors will get far, far poorer results. Marketech believes this is the key takeaway from this research report: There was a strong correlation between learning from an exhibitor and being more inclined to buy from them. For example, when an attendee learns something new, they were 27% more inclined to buy from the exhibitor, but if they did not learn something new, they were only 6% more inclined to buy from the exhibitor. An attendee who learns from you is more likely to become your client. The size of this study – based on over 3,000 interviews – gives you an unprecedented body of experience to help you enhance your trade show program. There’s great advice here, especially about drawing in attendees with product info, promotions, and the right people, and about creating a true learning environment to make attendees more likely to buy from you. 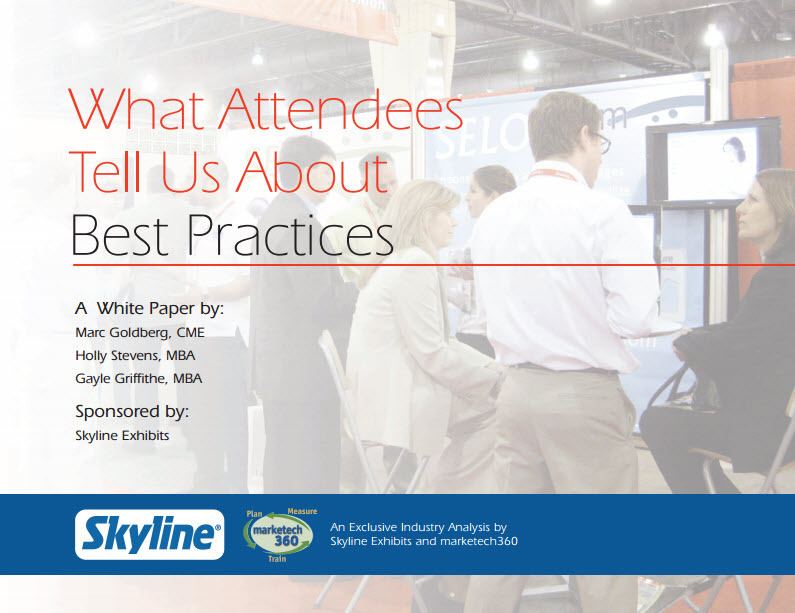 Boost your trade show results with insights from this new white paper, What Attendees Tell Us About Best Practices, based on over 3,000 interviews with trade show attendees. Complete the form to get your free copy now.